It is not an unusual news in Budapest that each week-end bringing a bunch of places to be visited by locals and tourist staying in Budapest… Therefore, here is just one of those situs to be visited if the time is right for folks to be there. 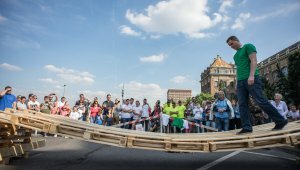 The best of the Hungarian Hitchhiker’s profession are hired to build bridges from roofs, adhesive tapes and angles at Széchenyi István Square, beside the Chain Bridge. These bridges to be built are “only” 6 meters, but they need to get through the constructions built-in a few minutes, and/or even carry cca. 10-pound of weight built ont he Bridge Builders Day, May, 20, at the outskirts of the Academy Building. On the occasion of the Bridge Builder Day traditionally held at the end of May, St. Nepomuk, is an integral part of the bridging competition, but many other programs make this day cheerful.. You can board on a special vessel and/or take a walk along the Chain of the Bridge Chain. The day will be opened by a water parade, rowers, dragonmen, kayak canoes, AM Danube Warships of the Hungarian Defense Forces, Holy Flora Firefighters of the Disaster Guard, Mahart PassNave Tersus, KDVVIZIG and other motorboats. From Noon to 6 p.m. there will be a guided tour of the Lajta Monitor Ship, the Kossuth Museum Boat, a visit to the Chain Bridge, story telling about István Széchenyi’s life. Access to the event is free of charge. Events and timing: Water parade on the River Danube – Saturday, May, 20. 2017. from 10.45 a.m. – 11.30 a.m.
Events in front of the Academy, localtion: Széchenyi István Square – Budapest – from Noontime – 6. p.m.